In the first decades of the 20th century, Riverside, California, was at its zenith. Riverside County was the richest county per capita in the U.S., buoyed by citrus riches and tourism. Styled “The City Beautiful,” Riverside boasted magnificent homes in the Craftsman and Mission Revival styles, and the Glenwood Mission Inn was on its way to becoming an internationally famous resort. It is little wonder that Army aviators from San Diego’s Rockwell Field flew to a dirt strip southeast of town, called Allesandro Field. In 1917, with the U.S. finally in the Great War, a sergeant landed at Allesandro Field, leading the first contingent of enlisted men to establish a major training base. Riverside’s civic leaders were air-minded men, and wanted the city to have a municipal airport. There was a lot of aeronautical activity, for the time: Clarence O. Prest built 50-some airplanes in a former citrus packing house at the corner of Indiana and Arlington, using the dirt street for a landing strip. Barnstormers frequently set up shop in vacant fields on the fringe of town. But these were not a regular airport, and Riverside’s establishment knew that one was needed to put Riverside on the air map. The Chamber of Commerce and the Junior Lion’s Club took a lease on a field which was part of the Evans Ranch, just west of the Santa Ana River, on the main highway to Los Angeles, and graded out a small field. All they needed was the right man to run it. They soon found him, or he found them: it was the colorful “Cowboy Aviator” Roman Warren. Warren was born in 1892 in Joliet, Illinois, and raised by his mother, whose husband had deserted his young family. At age 10, he went into the world, finding work driving a horse and carriage for a Professor Darling, which whom he lived. At 14, he began riding the rails, earning his passage by “pulling down coal” and breaking it for the fireman. In Kansas he helped an old railroad man put on a roof and build a shed, and in turn received an open letter to railroad men, which worked as a free pass to ride the freights. A little later he went to Montana and found work cowboying on the K-6 ranch at Beaverhead. Here he learned all there was to know about horseback riding, and the hundreds of handyman tricks essential to being a cowboy. In the winter he worked as a deputy sheriff in Bannack. He ranged afield to Colorado, where he traded horses, but came back to Colorado. In 1918 he was one of the cowboys who was picked to accompany the livestock on the train to the cattle yards in Chicago, and while there he went out to Maywood Field on the West side, and tried to join the Army Air Service. He was turned down for lack of education, but the war had wound down and some of the instructors gave him informal instruction in Curtiss Jennies, and soloed him. Early in 1919, Roman bought a surplus Jenny in a crate, assembled it, and headed out to live the life of a barnstormer. He flew from town to town, doing loop-the-loops and whifferdills, substituting for the parachutist when the latter was too drunk to jump, and having many adventures. In Peoria he buzzed a bridge to see the people on it scatter, but the engine in his Nieuport quit and he had no choice but to fly under the bridge. Once under it he dragged the tail in the water and “pancaked” onto the shore. Barnstorming lost its charm by the mid-twenties, as the field became crowded, the crowds became jaded, and the dollars became scarce. Roman remembered Riverside, where he had dead-sticked to a landing on a vacant field at Indiana and Chicago, having run out of gas on his way to Los Angeles. A school boy, Johnny Hammond, helped him find a place to stay and the next day got tickets printed for barnstorming rides. In 1924, Roman returned and helped to run a field on Jurupa Avenue. In 1925, the City of Riverside created a Commission on Aeronautics and took control of the Mission Boulevard field cleared of brush by the Junior Lions Club. Warren flew from the Jurupa field and made the first landing in a Jenny, avoiding the stumps and brush which were still present. The lessor, Pliny Evans, had retained the right of pasturage, and Roman’s first job was to build a barbwire corral, not for the cows, but to put the airplanes in at night so the cows did not eat the sweet doped fabric covering. Business was not good. An airport in 1925 was not much like an airplane of the 21st century. No one went to the airport to catch a plane to somewhere; only a few hundred passengers flew in that year, perched on top of the mail sacks in open cockpit biplanes. It was a year before the Air Commerce Act, which first brought the national government into civil aeronautics. It was two years before Lindbergh flew the Atlantic solo and brought about the “Lindbergh boom” in aviation. 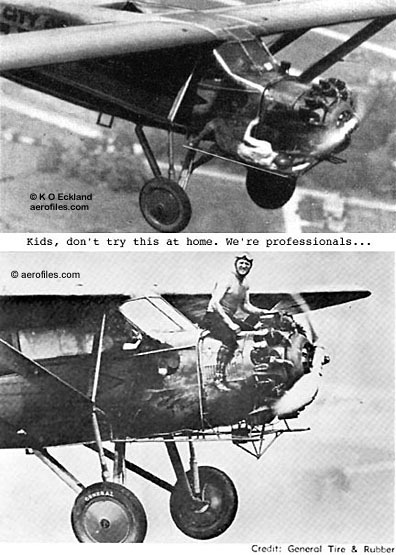 Warren could make a living only by teaching students to fly, giving “joyrides” to air-minded citizens, flying an occasional charter or package delivery, and, on rare occasions, selling gas or hangar storage to transient pilots. Seeking to increase his business by publicity, he remembered his inadvertent flight under the bridge in Peoria, and announced that he would fly under the Rubidoux bridge over the Santa Ana River, only a few hundred feet from his “Riverside Airport.” Warren was not the only aviator to have flown under a bridge. Others had done so and their flights had been featured in newsreels. But no one had ever flown under a smaller bridge opening. From the water to the highest point on the shallow arch was only sixteen feet. Warren’s Thomas-Morse S4C Scout was 8’1″ high, so he would have less than four feet above and below him, not much margin at 100 miles per hour. The “Tommy-Morse” was a single-place pursuit, built in America for World War I, but too late for combat. It was a good “stunter” but having only one seat was useless for barnstorming because no rides could be given. On June 14, 1926, Warren took off, did a few whifferdills and loop-the-loops, and headed for the river. Most of Riverside seemed to have turned out and was on top of the bridge. This would never do, in case Warren missed, so he buzzed the bridge a few times to clear the crowd, who got the message and trooped down to stand on the river banks. As Warren said later, “They had not come to see me make it; they had come to see me not make it.” Heading downstream, Warren reversed course and triumphantly flew through the tiny opening between arch and water. Later, at the airfield, the triumph faded a little when it became clear that none of the hundreds who followed him there were interested in a ride in any of the “ships”; they thought Warren was crazy. Warren said ruefully that he went to bed just as hungry that night as he had the night before. You can see some newsreel footage of the famous Bridge Flight and other highlights of Warren’s Riverside Airport at the Mission Inn Foundation’s website. In due course, as the publicity spread, business did pick up, and Warren gave flying lessons to Riverside Mayor Long and a number of businessmen, lawyers and doctors. He had flown in the first Southern California Fair and Fiesta de Anza in 1925, flying the Thomas-Morse against a racing automobile driven by Riverside’s hometown favorite race driver Johnny Vicker. In 1927, was asked to repeat his Bridge Flight under a specially-constructed wooden arch in front of the grandstand. The arch opening was the same as that of the Rubidoux bridge, but a little narrower. Warren made the flight 13 times during the 1927 and 1928 fairs, but then quit because it seemed to him that the crowd was more hopeful of a gory crash than appreciative of precision flying. Perhaps the bridge flight publicity did some good, because three months later (September 17, 1926) Warren was hired to fly oilman Edwin Pauley and his district manager Helmer Duncan to the opening of a new gas station in El Centro. Pauley’s Eureka Oil Company furnished the lubricating oil for Warren’s ships and had its name painted on the lower wings. Warren flew the pair to El Centro in a Bird cabin biplane, with two passengers inside and the pilot outside. (Airplane pedants: this had nothing to do with the later and more famous Brunner-Winkle Birds but was a one-off made by W.W. Bird in San Diego.) The next day, on takeoff for the return trip, the 90 h.p. OX-5 suffered a partial power loss, and the ship clipped a high tension line and dove in nose-first. Warren was trapped, dangling upside down from a flying wire. He had a pair of pliers in his pocket, and was able to pull the cotter pin out of the wire terminal and drop to the ground. He pulled Pauley and Duncan out of the fuselage and crawled to a farmhouse for help. Duncan had been killed, and Pauley’s neck was broken, but he survived, bedridden for a year. Had Pauley died, history might have been very different, because he went on to become the treasurer of the Democratic Central Committee and, more than anyone else, was responsible for Harry S Truman’s nomination as vice president in 1944. Will Rogers asked the Hunters to come to Hollywood to talk about a movie based on airplane endurance flights. They flew west in The City of Chicago, piloted by John, and Big Ben, piloted by Albert and “Beans,” accompanied by Walter in a Travel Air 4000 NC5241. We know that they were in Tucson on July 20, 1930, where they remained overnight. They then set out for Los Angeles to meet with Will Rogers. We are therefore justified in believing that this photo was taken on July 21, 1930, the next day, when the brothers stopped for fuel at Riverside Airport. Why Riverside? We don’t know but we do know that just about nine months before, airport manager Roman Warren had flown the refueling ship for the successful women’s endurance flight of Bobbi Trout and Elinor Smith at Metropolitan Airport (Van Nuys). Roman had a variety of jobs to make ends meet and at this time, in addition to running Riverside Airport, he was chief pilot for the Commercial Airplane Company of Los Angeles which made the “Sunbeam” in with Trout and Smith set their record. We may speculate that the Hunter brothers wanted to give their business to a fellow endurance flyer. Unfortunately for the movie venture, on July 21 — the day we think this picture was taken — two other guys went up in a Curtiss Robin at St. Louis with the declared intention to break the Hunter brothers record. And for a long time it was thought that they had, until a year or so later when it was learned that they had landed for repairs and were disqualified. In the meantime, however, the Hunters had had their fifteen minutes of fame, and the movie deal went away. Albert quit flying; Walter became a pilot for American Airways; Kenneth became a test pilot for Lockheed; and John had a mail run, but was killed in 1932 when struck by a prop while untying an amphibian from the dock. A lot of this information came from a great website, the Davis-Monthan Airfield Register. A warning: it is so absorbing to aviation history buffs that we advise not getting started until you have a big chunk of time. Click here to learn more about the Hunter Brothers. May 8, 1932, saw the arrival of Captain Claude A. Owen, factory demonstration pilot from the Pitcairn Aircraft factory in Philadelphia, in a new Pitcairn “sport model” PA-18 autogyro. Captain Owen was drumming up business on the West Coast, and was delivering the ship to a “Los Angeles sportsman.” He had come from Phoenix in only 3.5 hours. Here is a link to a video of a flying restored Pitcairn PA-18. The Jack Frye who flew the Fokker Universal went on to become the co-founder and president of TWA.